HIGHLIGHTS: Paddling through a salt marsh to the open ocean, great birdwatching, riding the tides. DEPART FROM: Route 77 boat launch beside the bridge over the river. WATCH OUT FOR: Crashing waves as you approach Higgins Beach, strong currents, mud flats. This saltwater creek in Scrarborough starts in the salt marsh of the Rachel Carson National Wildlife Refuge and ends in the surf of Higgins Beach. If you time the tides just right, you’ll ride the ebb tide down this narrow, winding wetland stream to its mouth at the ocean and then let the flood tide push you back up the river to your car. It’s more likely, though, that you’ll end up paddle against the current one way, so be prepared to paddle a little harder on one leg of your trip. 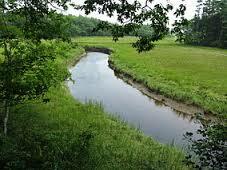 Spurwink River is a great wetland alternative to the nearby Scarborough Marsh. It's also a great way to get to Higgins Beach if you don't want to deal with parking there. Be careful as you approach the end of the stream, though, because you’ll eventually face the open ocean and on many days you’ll find waves and swift currents. About 20 minutes from Portland. A NOTE ABOUT SAFETY: Sea kayaking responsibly on Maine's coastal waters requires preparation, skills and knowledge. Casco Bay and the waters nearby present a potentially dangerous environment due to very cold waters, busy boat traffic and exposure to the conditions of the Atlantic Ocean (including sudden fog and strong winds). This is why we encourage people to take our lessons or join our guided trips before venturing out on their own. One fundamental skill that is essential for sea kayaking is the ability to rescue someone from a capsize. It can be extremely difficult to re-enter a kayak in cold and turbulent water. Anyone who paddles in the exposed waters of the Maine coast without this knowledge (or someone else who has that knowledge) is taking an extremely high risk. Sign up for our "Rescue Clinic" to learn these rescue skills.